Ceres is the largest object in the asteroid belt between the orbits of Mars and Jupiter. This super rock has been the focus of many studies, particularly one bright spot that has risen questions in all those involved with its study. 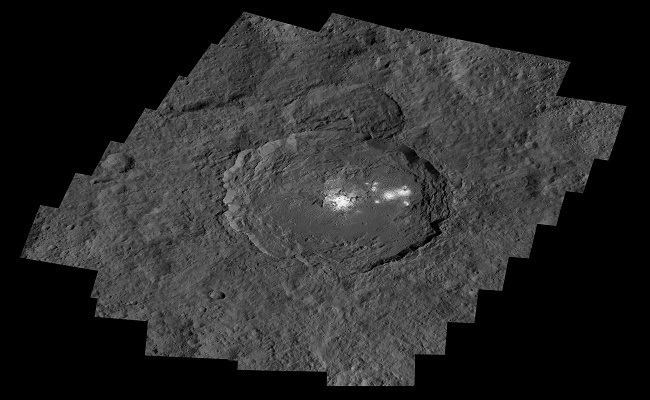 But thanks to the Dawn spacecraft, that bright area has now been further “illuminated.” What was discovered? A “salty” spot. 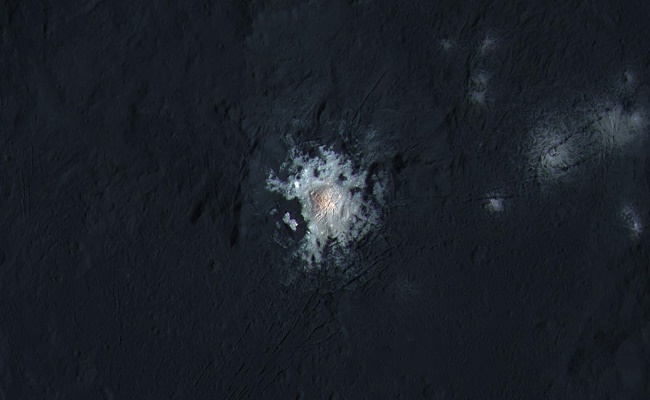 Taken from the altitude of 239 miles (385 kilometers) the bright spot on Ceres was finally snapped by Dawn. Earlier this week NASA released the high-resolution images at the Lunar and Planetary Science Conference in Texas. The photos were taken within the Occator Crater which expands approximately 57 miles (92 kilometers) across the space rock, showing there is indeed evidence of salt deposits. Occator’s central pit often forms icy bodies and has shown to also have a dome-shaped peak. Here the salt deposits appear to be spread across this dome, which is lined by crisscrossing fractures that seem to mostly radiate outwards from the center. An enhanced close-up of the salt deposits in Occator Crater, revealing the dome-shaped structure and crisscrossing fractures. Image: NASA/JPL–Caltech/UCLA/MPS/DLR/IDA/PSI/LPI. However, there is one mystery still lurking among that crater; why do the salt deposits look so fresh? When Dawn first arrived at Ceres, it did detect water vapor which lead the team to suspect that fresh material of some sort has been welling up from beneath the surface for quite some time; the crater is believed to have formed 80 million years ago. A wider view of Occator Crater, showing the salt deposits in high resolution. Image: NASA/JPL–Caltech/UCLA/MPS/DLR/IDA/PSI. This wasn’t a total shock, as scientists already suspected Ceres would contain plenty of water-ice just beneath its surface. To test this, Dawn comes equipped with an instrument called the Gamma Ray and Neutron Detector (GRaND). This wonder-instrument has also been able to detect that Ceres’ largest stores of water-ice appear to be in its polar regions. What more fascinating wonders will the Dawn spacecraft reveal about Ceres? Time will only tell. Until then keep your eyes and telescopes aimed towards the night sky.